We are in the midst of an explosion in the number of nearsighted (myopic) children. A 2002 study on the rate of nearsightedness in the United States showed a 41% increase in the number of nearsighted Americans compared to the original 1972 study. On average, a child in the U. S. will see an increase in myopia of .62 diopters per year. Fortunately, current research shows preventing nearsightedness in children is possible with great success. A great deal of research is currently underway to determine what makes us more nearsighted and what might be the most effective method of preventing nearsightedness in children. Much of the latest research in preventing nearsightedness in children is being done in China. Over 70% of Chinese children under 15 are now myopic. Needless to say, the Chinese government is putting a lot of resources behind the treatment and cause of the Myopic Epidemic. Your genes do play a significant role in the type and degree of prescription you have. However, it’s not all genetic, environmental factors also appear to provide a strong influence in modifying your genetic propensity to progressive myopia. Even though our genetics may predispose us to being nearsighted there are things we can do to modify this trait. The majority of a person’s nearsighted prescription occurs during childhood. Therefore, finding ways of preventing nearsightedness in children is currently the most effective method of slowing the myopic epidemic. We should only rely on methods based on sound scientific studies to guide us in finding and using effective treatments in preventing nearsightedness in children. Orthokeratology involves the use of a contact lens that acts as a corneal mold (the cornea is the clear window covering the colored part of the eye) which changes the shape of the eye. The orthokeratology lens causes an optical effect known as peripheral defocus which reduces the stimulus to progressive nearsightedness. Orthokeratology has been FDA approved since 2002. Studies show orthokeratology reduces the rate of myopic progression up to 90%. This shape change has been clinically proven to slow the progression of nearsightedness in children. An Ohio State University study showed that orthokeratology slowed the rate at which the eye grows longer. Keeping the eye from growing longer is a key factor in preventing the progression of nearsightedness. Other studies, conducted all over the world including the United States, China and Europe, have shown rates of reduction between 50% and 90%. Orthokeratology provides a clinically proven, effective means of preventing nearsightedness in children. Orthokeratology and atropine therapy show similar rates of myopia prevention. Atropine is a medication discovered in the 19th Century. It is still used today for both systemic and ocular conditions. In the eye it is used to dilate the pupil and to freeze the eye’s ability to focus. Atropine is a proven, time tested method of reducing the progression of nearsightedness in children. For over 40 years atropine has been the mainstay of myopia prevention. Due significant side effects, such as light sensitivity and near vision blur, the treatment drop-out rate with Atropine is high. Studies show however, low dose Atropine is almost as effective as full strength Atropine. Low dose Atropine is easily tolerated by patients. At Total Eye Care we will often combine Atropine therapy with specially designed myopia control orthokeratology lenses. We believe this combination is currently the most effective method of preventing nearsightedness in children. Changing how we go about our daily activities can affect the progression of nearsightedness in children. Studies have shown children that spend more time outdoors are less nearsighted. Breaking up the day to day routine by spending time outdoors, away from near centric activities is helpful in preventing nearsightedness in children. Not prescribing the full prescription or under-correcting nearsighted prescriptions is easily the most common myopia myth. A Chinese study prescribed glasses to approximately 300 school age children. Half of the children were given the full prescription and the other half were under-corrected. After only 18 months the study was terminated early because the under-corrected group’s myopia accelerated at a much faster rate than the fully corrected group. Under-correcting a nearsighted person’s prescription, not wearing prescribed glasses, and wearing an outdated prescription all lead to thicker, stronger prescription. Wearing current, accurate prescription glasses is the first step in preventing nearsightedness in children. The short answer is a resounding no. The Bates Method is ineffective in preventing nearsightedness in children. The Bates Method has a lot of unfounded support in social media. Dr. Bates was an early 19th century ophthalmologist. Bates hypothesized that various techniques, such as resting the eyes and pressing your palms (palming) to your eyes would reverse myopia. The Bates Method has been tested extensively, using scientific methods, and has been shown to have no affect on the reduction or reversal of myopia in adults or children. More information on the Bates Method can be found in Dr. Driscoll’s Book “An Eye Doctor Answers: Explanations To Hundreds Of The Most Common Questions Patients Wish They Had Asked” along with extensive information about effective, scientifically proven methods of preventing nearsightedness in children. By incorporating proven myopia reduction orthokeratology lens designs and atropine therapy we greatly reduce the rate of myopic progression in children. By reducing a child’s myopia, we also reduce their lifetime risk for numerous ocular conditions such as glaucoma and retinal detachment. Putting a once self-conscious, glasses wearing child, or teen, into contact lenses is a life changing event. Making the transition from glasses to orthokeratology or traditional contact lenses is one of those “moments” in a child’s life they will always remember and for which they will always be grateful. As parents we know the importance of instilling a sense of self worth and self esteem in our children. Transitioning a child from thick glasses to contact lenses helps to achieve just that. To learn more about orthokeratology for adults and children and preventing nearsightedness in children schedule a free orthokeratology consult with Dr. Driscoll at the Total Eye Care Colleyville office or call 817.416.0333. OrthoKeratology is an FDA approved procedure that improves a person’s vision without surgery, glasses, or daily contact lenses. Many patients refer to it as “braces for your eyes”. Summer provides a great opportunity to start an orthokeratology program for your child. Imagine enjoying sports like swimming, gymnastics, and dance without the use of contact lenses or glasses. The nearsighted prevention benefits provide a tremendous added bonus to a summer orthokeratology program. It’s great being able to enjoy life and sports in general without contact lenses or glasses; however, a significant benefit of orthokeratology is that it has been clinically proven to slow the progression of nearsightedness in children. Numerous studies have shown the rate of myopia reduction is between 50% to 90%. A landmark study on the rate of myopia in the US was completed in 1972. This study found that 25% of the US population was myopic (nearsighted). A follow up study completed 41 years later found the rate of myopia in the United States had increased to 41% of the population. Complete analysis of these two studies can be found here in this earlier TheEyeDocBlog.com entry. High myopia increases a person’s risk for many conditions such as glaucoma and retinal detachment. By decreasing a child’s amount of nearsightedness we are decreasing their risk for these, and many other, conditions. Overnight orthokeratology was approved by the FDA in 2002. This was game changer for orthokeratologists. Prior to overnight orthokeratology’s FDA approval, patients would wear their retainers every other day, which was not ideal. Now patients wear their lenses at night, removing them upon waking and enjoy good vision all day, every day. 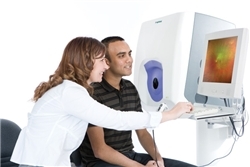 We are often asked if the vision correction lasts more than one day and yes it does. If a patient forgets to wear their lenses one night their vision is still good the next day. Skipping a day of wearing your vision retainers may not result in a second day of 20/20 vision, more likely 20/25 or 20/30; however, very good, functional vision is still maintained. It takes days and most often weeks for the vision to return to the pre-treatment level. The first thing we hear from patients after they have undergone OrthoK is that they can’t believe it works. “My daughter put her lenses in when she went to bed, she took them out when she woke up and says she can see fine” is a common theme. Another common topic is “why haven’t I heard about this before” and there are many reasons for this. Why Haven’t You Heard About OrthoKeratology or Gentle Vision Shaping Before? Quite simply, there are well under 1000 active orthokeratologists in the United States. With orthokeratology experience matters and there is a significant learning curve in becoming an orthokeratologist. New optometrists and ophthalmologists receive very limited orthokeratology training in school. Dr. Richard Driscoll has been an active orthokeratologist since 1999, helping countless patients achieve good vision without the use of daily contact lenses, surgery, or glasses. Adult patients, kids, and parents alike express amazement at how we can alter or mold the shape of their corneas with a contact lens, resulting in clear vision during the day without the need for glasses. It’s not magic, the science is very well established and FDA approved. We remold the cornea into a shape similar to what is done with LASIK. The difference is that Ortho-K achieves this without the use of a laser and it does not remove any tissue; therefore, it is reversible, and easily modifiable. Who is a Good Candidate for Orthokeratology? Here is a quick list of those patients that benefit from orthokeratology. A more complete list of what makes a good orthokeratology candidate can be found on the OrthoKDoctor.com Website. What are the Benefits of OrthoKeratology? A team of scientists from the University of Southern California published a study in the Journal of Neurology August 30 indicating they could use a patient’s eye movement patterns to detect Parkinson’s Disease with 89.6% accuracy and Attention Deficit Hyperactivity Disorder or Fetal Alcohol Spectrom Disorder with 77.3% accuracy. This is great news in that, with a simple, inexpensive test, patients can be screened quickly and accurately for these debilitating disorders. We continue to see that the eye is a portal to ones health leading to the diagnosis of other conditions. With the increased rate of myopia in the US population, orthokeratology is becoming an increasingly important treatment option for our patients. Dr. Driscoll is a member of the Orthokeratology Academy of America that produced the excellent video shown below. The video gives a comprehensive overview of orthokeratology, including its pros, cons, and how it works. We highly recommend that any patients considering refractive surgery, such as LASIK and PRK, or orthokeratology view this video. By the way, comments are much appreciated so don’t be shy.